When I was a little girl, I spent a lot of time with both of my grandmothers. One grandmother liked simple things, the other liked fancy things. One grandmother didn’t care for knick-knacks (they were “dust catchers”); the other’s home was awash with them. I loved them and their styles both, but some things stand out in my mind. Grandma Mayer had a dining room in the Mayer family home on Havre’s East End. I’m told the building was originally a general store from Kremlin and hauled into Havre by my grandfather; whether or not that is accurate is unknown at this time. Grandpa went to work making rooms in the structure, and included a dining room which was Grandma’s pride and joy. NO ONE “messed around” in that room, not even Grandpa. I, however, was allowed to dust all of the wonderful things in that room, because Grandma could tell I enjoyed the same things she enjoyed, and she trusted me. In the room was an Early American revival style dining set, matching hutch, a console entertainment system, an Early American revival style round two-tiered table with railings around it and, believe it or not, an Early American revival style magazine rack. On the round table were several pieces of knick-knacks ranging from Fenton Art Glass to a set of graduating ducks, and the piece de resistance-a milk glass Gone With the Wind lamp with purple roses painted on it. It was neat, and Grandma always had it on in the evening so one could see where one was walking in the nighttime. The lamp is still in the home, now property of my Auntie Betty Jo. The lamp started a love affair with similar lamps, and I have already written about my beloved Fenton Art Glass Poppy lamp. The pictured lamp was purchased at a local thrift store. I knew it wasn’t Fenton, but I liked the design; it reminds me of Old Country Roses by Royal Albert. I knew it would be perfect for the entry for The Cottage, which is where it is currently. I use it as Grandma used hers for; to be able to see where we are going if we need to get to the front of The Cottage in the middle of the night! 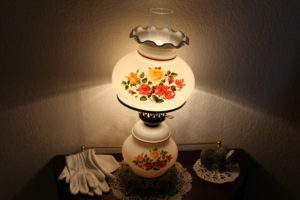 Doesn’t this lamp remind you of Old Country Roses by Royal Albert?